In the 1970s, the Canadian champion and Kawasaki works rider Yvon Duhamel enjoyed considerable popularity in France. His favorite events were the 200-mile races run under the FIM formula, but in 1975, Duhamel announced his participation in Grand Prix with two entirely new machines: a three-cylinder 500 with liquid cooling and this intriguing 250. This miniscule 250, scarcely bigger than a 125, pioneered an engine configuration that would later make the fortune of the Austrian Rotax engine firm: the two hard-chromed aluminum cylinders were laid out in tandem with two counter-rotating crankshafts linked by straight-cut gearing. This exceptionally narrow engine had two rotary intake valves fed by big 32mm carburetors mounted on the left-hand. side of the motorcycle. up of upper and lower double cradles surrounding the engine. 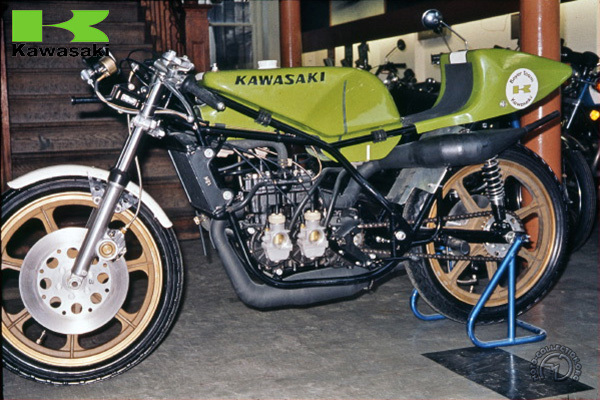 With 55 hp and weighing under 220 lb, the Kawasaki should have been competitive: but it was no match for the Harley-Davidsons and Yamahas. Apart from the compulsary 20 inch bancllebars, the widest part of 250 GP was its engine, 11.8 inches across.